President Trump's "Ultimate Deal": Is Israeli-Palestinian Peace Possible? Daniel Pipes took part in a January 11 panel discussion on the Palestinian-Israeli conflict at the Heritage Foundation in Washington, DC, appearing with Rep. Ron DeSantis, former Deputy National Security Advisor Elliott Abrams, and Heritage Foundation Senior Research Fellow James Phillips. The introduction to Daniel Pipes begins at 52:27 of the full event video. The transcript below has been lightly edited. For a complete transcript of the event, including Q&A period, click here. In reply to the above question, my answer is yes. But I propose a completely different approach from the current one to achieve it. The existing approach of a "peace process," which goes back 30 years, is not working. It can be improved, which the Trump administration is doing, but it ultimately will crumble because it depends on Palestinian acceptance of Israel, which has not come about, and is not coming about. And that is the problem that needs to be addressed, a problem that cannot be addressed by diplomacy. It needs to be addressed in a very different way. I'd like to take a step back into history before proposing the new approach. Please consider two sets of three dates. 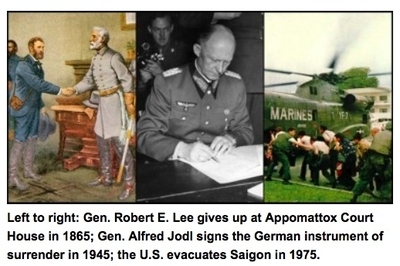 The first three are 1865, 1945, and 1975 – the end of the Civil War, World War II, and the Vietnam War. All of those were conclusively ended wars. They ended the fighting, nothing more followed. The South never rose again. The Germans didn't try to conquer Europe again. And Americans didn't return to Vietnam. 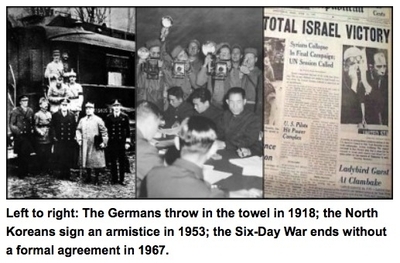 Then, three other dates: 1918, 1953, and 1967 – the end of the First World War, the Korean War, and the Six-Day War. Those were inconclusive. The Germans did try again. Any day, the Korean War could restart. Hostilities did resume between the Arabs and Israel. The difference between these two sets of dates lies in the losers' sense of defeat. In the former triad, that sense existed; in the latter, it did not. Losing a round of a war is not tantamount to feeling defeated. Defeat means the loser giving up on war goals. That's what we Americans experienced in 1975. Victory means imposing one's will on the enemy. The enemy gives up; the winner prevails. Applying this analysis to the Palestinian-Israeli conflict, one finds that for 45 years, from 1948 to 1993, the Israelis sought victory. After that, meaning since the Oslo Accords were signed, they have not. Israelis have tried various other approaches – appeasement, unilateral withdrawal, putting out brush fires – but not sought victory. The peace process has been dominated in those years by an emphasis on diplomacy, on assuming that what PLO leader Yasir Arafat said on the White House lawn in September 1993 was valid – that the Palestinians now accepted Israel, that the war was over. But it wasn't, and it isn't. It continues. So, what is needed is an approach that confronts the irreducible problem of Palestinian rejectionism. Palestinian rejectionism goes back a century. It means saying no Zionism, to Jews, to Israel: no political contacts, no economic relations, no personal relations. Rejectionism, to be sure, has fractured and is no longer as pure as a century ago, but it remains a powerful force and constitutes the core of the problem. It must be confronted. And, as my co-panelist Elliott Abrams pointed out, there's a delusion among Palestinians – due to bad leadership, international support, Islamic doctrine, the Israeli security services' mentality – that they can defeat Israel, that they can cause the Jewish state of Israel to disappear. That fantasy needs to be broken. That is what the U.S. government, as a great power, needs to deal with. I'm suggesting that it should adopt a policy encouraging the Israelis to win. To win, as in 1865-1945-1975, to end the conflict by causing the Palestinians to understand that the jig is up and they lost. When they're really upset they can write a strongly worded letter to the editor. Enough with the UN resolutions against Israel; enough with building up militaries; enough with the campus BDS. Enough. Over. It's done. I'm hoping that some American president – this one or a future one – will say to his staff, "You know, diplomacy isn't working. We've been at this for decades, it's not going anywhere. Is there an alternative?" And yes, there will be another alternative, what we call Israel Victory. As you heard in Rep. Ron DeSantis's bio, he is co-chairman of the Congressional Israel Victory Caucus, which now has 32 members. There are 26 members of the Knesset Israel Victory Caucus. We just began this effort a year ago, under the auspices of Gregg Roman, director of the Middle East Forum; EJ Kimball, who heads our Israel Victory effort in Washington; and Ashley Perry, who heads it in Jerusalem. We're building a political and also an intellectual base, the latter by giving talks like this, commissioning studies, building this idea up as an alternative to the existing paradigm. Let me emphasize that this is an approach, not a policy. We're not saying two-states or not two-states. The point is, Israel needs to convince the Palestinians that it's over. The conflict has been resolved by the objective facts in that Israel is a flourishing, powerful state whereas the Palestinians have oppressive and dysfunctional polities. It's a long-term effort. The goal is not to change policy in the next few months. But it is, with time, to put something else on the table that fits the historical pattern. You don't end wars through negotiating. Think of Vietnam: It didn't end through diplomacy but by the North Vietnamese army coming in and taking over. Wars end when one side gives up. We have close relations with Israel. As Rep. De Santis said, we share interests and a moral base with it. Therefore, we should help it win. Ironically, once the Palestinians give up, then they can go on to build something good. When they abandon the foul, irredentist goal of eliminating the Jewish state, they can then build their own polity, economy, society, and culture. In the long run, the Palestinians will gain even more than the Israelis. Yes, the Israelis will not be murdered on their way to the pizzeria, will not face this barrage of hostility at the United Nations and elsewhere. But Israelis already live the good life. Palestinians don't. They live under oppression, backwardness. They will only be able to build once they give up on rejectionism and move on to something constructive. So, I hope you will join us at the Middle East Forum in advocating for this approach, with your members of Congress, intellectually, and in other ways. This offers a new paradigm that pulls us out of the mire of the "processing" that goes nowhere and that, in fact, is counterproductive. Palestinian-Israeli relations are worse today than 25 years ago, when the Oslo Accords were signed. So, we need new thinking. I offer this to you as new thinking, as a way for the "ultimate deal" to be achieved. Mr. Pipes (DanielPipes.org, @DanielPipes) is president of the Middle East Forum. © 2018 All rights reserved.